So simple and so beautiful. We had one too, it has bloomed and faded already. How beautiful! And it does match your valance perfectly. Gorgeous! I usually grow some amaryllis but neglected to do so this past Christmas, so it is lovely to see yours here. Jennifer I have the exact same one ready to pop at my house! It is an awesome photo with your perfectly matching valance in the background. Beautiful! Ours has bloomed and I'll blog about it today. Really splendid to look at. Greetings! Beautiful . I love the variegated colour. 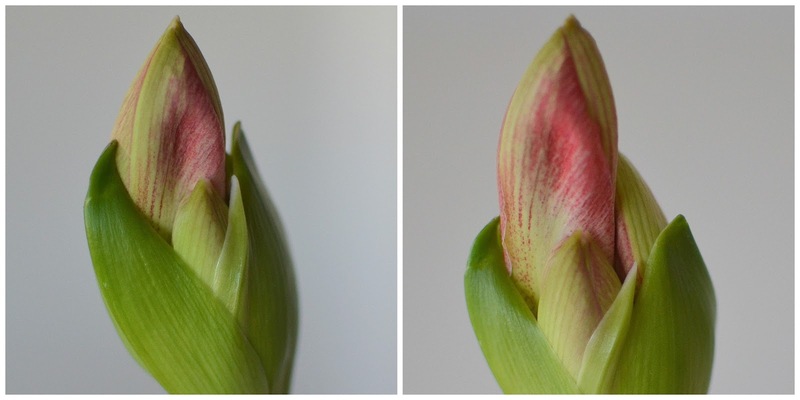 Gorgeous photos Jennifer - I love that you've captured the blooms emerging. 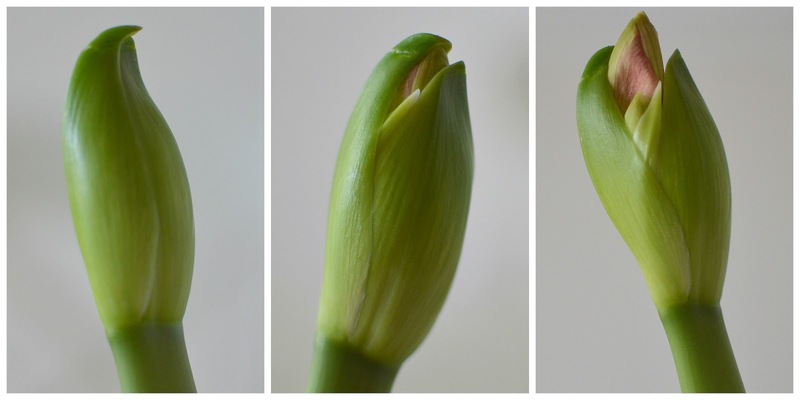 I do love to see an emerging flower bud! The shapes, colours and form. Plants are so incredible. It looks fabulous on your table. Hi Jennifer! Oh, I love it! The color is so vibrant and cheery! It's so pretty and it matches your curtains perfectly! Beautiful... I have grown paperwhites in the winter but never an amaryliss. It is beautiful! I have never got one to see it bloom. Like the person in the previous comment I too have had only paperwhites and it was many years ago. What a lovely thing to do and see the beauty unfold. They're fabulous plants, aren't they? Big, blousy and beautiful. It goes so well in your kitchen too. Eleanor bought me a bulb for Christmas so I've just started it off, I'm looking forward to it flowering. this one is beautiful....mine is still at the tight bud stage; i'm hoping for a valentine bloom!! Near year I am totally buying an amaryllis. I love your beautiful flower. Last year I kept my bulb and wanted to see it flower again, but it only had big long leaves and no flower. Next year I am back to buying a new one. Gorgeous! I'll have to look into getting a few bulbs next year, they are stunning.